Tiziano Vecellio (sometimes Vecelli), better known as Titian was the leading painter of the Venetian School during the Renaissance in the 16th century. During his lifetime he was often known as Da Cadore, a name from his birthplace of Pieve di Cadore. Recognized by contemporaries as "the sun amidst small stars", recalling the famous final line of the poet Dante's Paradiso, Titian was one of the most versatile of Italian painters. He was equally adept with portraits and landscapes, genres which first brought him fame, but also mythological and religious subjects. He trained at a young age with Sebastian Zuccato, then with the Bellini Brothers, Gentile and Giovanni, sons of Jacopo Bellini. The Bellinis were a renowned family of painters from Venice and exposed Titan to many other prominent artists. This included the famous Giorgione, whose painting, The Sleeping Venus, is of evident influence to Titian’s The Venus of Urbino and Venus and Cupid, both now in the Uffizi Gallery. Living to an exceptionally old age for the time, his manner changed so drastically in his later years that some critics believe it could not have been same artist. What unites the two parts of his career is his deep interest in colour, emblematic of the Venetian School. His later works may not contain vivid, luminous tints as his early pieces do, yet their loose brushwork and subtlety of polychromatic modulations have no precedents in the history of Western art. Titian’s impact is vast to all of European painting, with his name frequently mentioned as a source of profound influence to other artists. In the Titian Room in the Uffizi Gallery, are some of the artist’s most praised portraits, additional to his mythological works of Venus. This includes a portrait of Bishop Ludovico Beccadelli, Portrait of Caterina Coronaro as Saint Catherine of Alexandria, portraits of Francesco Maria della Rovere and Eleonora Gonzaga della Rovere, Portrait of a Knight of Malta, as well as his Portrait of a Man, “The Sick Man”. His portrait of, Flora, also in the Uffizi is noted as a work of such beauty that it captures the early period of Titian entirely; with “warm and impassioned intensity of colour.” (Kren and Marx, Web Gallery of Art) This work shows the use of the brownish-orange color that was given the name “Titian”, for his frequent use of it. As with his portrait of Flora, the colour was especially seen in the hair of his early idealized portraits of courtesans. It is said that few of Titian’s pupils and assistants became highly regarded in their own right, and for some being his assistant was a lifetime career. Of his best know pupils were Paris Bordone (1495 – 1570) and possibly the famous Greek painter, El Greco (1541 – 1614), in Titian’s final years. 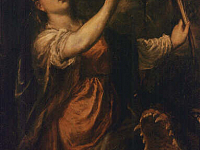 The painting, Saint Margaret, in the Uffizi, is attributed to Tiziano Vecellio, called Titian and Assistants.